The Catuvellauni occupied the central part of England, encompassing London, Hertfordshire , Bedfordshire, Buckinghamshire, Cambridgeshire, Oxfordshire, parts of Essex, Northamptonshire. Caesar was known for recording events in a manner that turned defeat into victory, and may have tried to play down the role of the Catuvellauni in their defiance of his forces. This tribe was known for having strong leadership and a well organised structure with an effective fighting force. Which was how they managed to take over the land occupied by the Atrebates, Trinovantes and the Cantium. The reasons for expanding outwards from their own territory were mainly political rather than just a desire to dominate surrounding areas. The Catuvellauni were very much an inland tribe and wanted to take advantage of the new found wealth that came with European trade. The tribe wanted to have control over the tribes most likely to threaten their superiority of central England. Supplies of goods and produce had to transported through hostile territory. The wanted to have more access to the coastal regions of Britain, thereby enabling them to defend their territory more effectively. It is interesting to note that Caesar does not actually mention the Catuvellauni, just their leader Cassivellaunus. Wheathamstead - (Hertfordshire) - Situated just north of St. Alban's, is reputed to be the site of the decisive defeat of Cassivellaunus by Julius Caesar in 54BC. Sulloniacis - (Brockley Hill, Greater London) - A settlement which was the centre of an important pottery industry. Durocobrms - (Dunstable, Bedfordshire) - Minor settlement where Watling Street crossed the Icknield Way. Magiovinium - (Dropshort, Buckinghamshire) - A Major settlement and road station at the crossing of the Ouzel. Lactodurum - (Towcester, Northamptonshire) - A small town. Bannaventa.- (Whilton Lodge, Northamptonshire) - A 4th century fortified town. Durobrivae - (Water Newton, Cambridgeshire) - Town beside the river Nene succeeded an early fort. Centre of the flourishing Castor potteries, and surrounded by a number of rich villas. Durovigutum - (Godmanchester, Cambridgeshire) - Small walled town and road centre mentioned in the Ravenna Cosmography. Duroliponte - (Cambridge, Cambridgeshire) - Listed the Antonine Itinerary. Alchester - (Oxfordshire) - Walled town, replaced early Roman Fort. Baldock - (Hertfordshire) - Posting station on Ermine Street. Billericay - (Essex) - Small settlement. Bishops Stortford - (Hertfordshire) - posting station on the Camulodunum - Braughing road. Blacklands - (nr. King's Sutton, Northamptonshire) - Settlement of uncertain character north of Alchester. Braintree - (Essex) - posting station on the Camulodunum - Braughing road. Braughing - (Hertfordshire) - Posting station and major settlement at the focus of several roads. Duston - (Northamptonshire) - Metal-working centre near Northampton. Dorchester-on-Thames (Oxfordshire) - Walled town, replacing an earlier native settlement. Fleet Marston - (Buckinghamshire) - Intermediate posting station on Akeman Street west of Aylesbury, between Alcester and Verulamion. Great Chesterford - (Essex) - Walled town, succeeding an early military site. Great Dunmow - (Essex) - posting station on the Camulodunum - Braughing road. Horseheath - (Cambridgeshire) - Small settlement. Irchester - (Northamptonshire) - Walled town. Kettering - (Northamptonshire) - An iron-working settlement of some importance. Little London - (Chigwell, Essex) - posting station on the Londinium - Great Dunmow road. Prittlewell - (Essex) - Small settlement. Sandy - (Bedfordshire) - Ermine Street posting station. Sawtry - (Cambridgeshire) - minor settlement. Welwyn - (Hertfordshire) - Small settlement. Wimpole Lodge - (Cambridgeshire) - Posting station. Woodeaton - (Oxfordshire) - Shrine and a rural market . Cassivellaunus The main opponent of Caesar in both of his expeditions. Cassivellaunus may have formed the tribe known as the Catuvellauni from a group of smaller tribes of Belgian origin living north of the Thames. The next identifiable ruler of the Catuvellauni was Tasciovanus who took the throne around 20BC, though whether he was the son or grandson of Cassivellaunus is unknown. Cassivellaunus may mean 'Vellaunus of the Cassi', when translated (His tribe was the Cassi and his name was Vellaunus.) The name given to the newly unified tribe gathered under his command could mean 'the Followers, or Smiters, of Vellaunus'. Unnamed King This unnamed ruler succeeded when Cassivellaunus died around 30BC, and it is suspected he married a daughter of Mandubracius of the Trinovantes of Essex. This would have made a bond between these two tribes that would enable them to coexist in relative peace. He died about 20BC leaving the Catuvellaunian tribe in the hands of his son Tasciovanus. Tasciovanus The grandson of Cassivellaunus, and the father of Cunobelin and Epaticcus. He was ruler of the tribe from 20BC, and the first Catuvellaunian king to issue inscribed coins, bearing the VER(ulamium) mint marks. He was also the first to turn against the Trinovantes, ending the long-established treaty between Caesar and his own grandfather Cassivellaunus. Between 10 and 15BC he issued a coins bearing the mint mark CAMU(lodunum). This would indicate that he had either taken the Trinovantes by force, or was claiming the territory for his own. Whether or not he actually ruler the Trinovantes is unclear. He was succeeded by his brilliant son Cunobelin AD10. Andoco Known only from inscriptions on coins, where his name appears as ANDO or ANDOCO, and on one issue as TAS ANDO in which it is assumed that his name appears with that of his overlord, Tasciovanus. The distribution of these coins suggest that Andocos or Andocoveros ruled over a territory on the western area of the Catuvellauni, and was issuing coin towards the end of the reign of Tasciovanus around 15BC-AD10) at the turn of the first century AD. He became 'the first British statesman' and through diplomatic means, probably held the thrones of both regions , for some of his later coinage bears the title "REX''. He continued to rule the combined tribes from Camulodunum for many years, and Camulodunum became the focal point of British politics, learning and trade. Suddenly, in about 40AD, he is believed to have suffered a stroke. Subsequent military actions by his sons Togodumnus and Caratacus, swept throughout south-east Britain deposing first their own brother Adminius from Cantium, then their old adversary Verica of the Atrebates. Cunobelin died shortly before the Roman invasion. Epaticcus A son of Tasciovanus, maybe the younger brother of Cunobelin. It is believed he moved further into Atrebatian territory and deposed king Verica, and installed himself at his capital, Calleva circa 25AD. He continued to take Verica's lands to west and south until his death, probably on campaign in 35AD, after which his desire to conquer surrounding lands was continued by his nephews Caratacus and Togodumnus in the late 30's AD. Adminius A son of Cunobelin, therefore to Togodumnus and Caratacus. He appears to have been given authority over the Cantium towards the end of the reign of Tiberius around 35AD, replacing the old chief Vodenos who may have died. Adminius was driven from Cantium by his two brothers, apparently with the approval of his father at around 40AD. 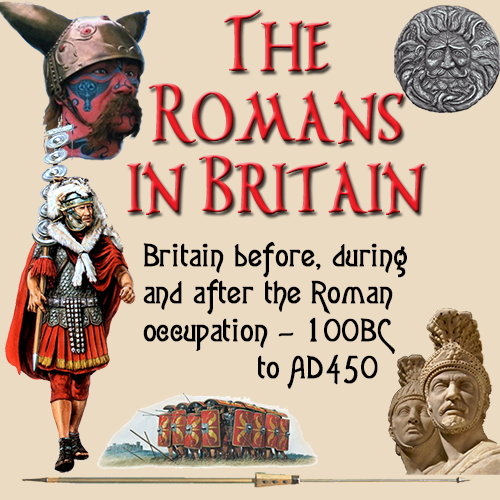 This was presumably because of his leanings towards the Romans, which had resulted from his governing that part of Britain closest to Gaul and so influenced by the Romans across the channel.. He probably had the idea the Romans would invade Britain, and so intended to ensure he kept his position in British society. He escaped capture and fled to Gaul, moving on to Germany in 41AD. He sought the support of Gaius Caligula and tried to persuade the emperor that Britain was ready to be taken at this time. The attempt of Gaius failed dismally, and Adminius no doubt accompanied the emperor back to Rome where he was subsequently returned to Britain by the emperor Claudius in 43AD, just before the invasion. It is possible that he was installed as the nominal governor of Cantium for his services, and possibly lived in the Villa discovered at Eccles near the crossing of the North Downs Way and the river Medway. Here he most likely spent the remainder of his life. Togodumnus A son of Cunobelin, and brother to both Caratacus and Adminius. While his father ruled the joint Catuvellaunian/Trinovantian kingdom from Camulodunum, and his brother Adminius governed Cantium from Durovernum. Togodumnus was given administrative authority over the Catuvellaunian tribe and based himself at the old capital of Verulamium around 35AD, following the death of his uncle Epaticcus who had previously secured the western borders of the kingdom by his occupation of the Atrebates capital, Calleva. When Cunobelin was incapacitated by illness in 40AD, Togodumnus supported the expulsion of Adminius from Cantium by his younger brother Caratacus. Following his fathers death around 42AD and his subsequent taking of the throne, he empowered Caratacus to resume the war against the Atrebates, who eventually forced Verica to flee to the continent. He fought at least two major battles against Aulus Plautius in 43AD and was either killed during the battle of the Medway, or died from his wounds shortly afterwards. Caratacus Probably the youngest son of Cunobelin, and brother to Adminius and Togodumnus. It is quite possible that he accompanied Epaticcus, his uncle, during his campaigns against Verica of the Atrebates from 25AD until his death about 35AD. Following the death of his father in 40AD, he took the throne from his elder brother Adminius. He then joined forces with his other brother Togodumnus in 41AD to carry on the campaign against the Atrebates.. He fought several battles against Plautius during the invasion of 43AD before retreating to Wales, where he incited the Silures and Ordovices to rise up against the Romans. During the change in Roman administration in 47AD, Caratacus led the Silures in a well-timed attack deep into Gloucestershire. The new governor, Ostorius Scapula, spent almost the whole of his term of office fighting against Caratacus, finally beating him in a final battle in mid-Wales in 50AD. Caratacus fled to the Brigantes in an attempt to find sanctuary and seek support from Queen Cartimandua. This was a foolhardy move as Cartimandua had already agreed a pact of non aggression with the Romans. This gave the Brigantes the perfect opportunity to show their loyalty to their Roman masters. He was held prisoner, then handed over to Scapula. He was sent in 51AD under guard to the emperor for punishment. Caratacus was a shrewd man who knew how to manipulate people, and although he had not managed to influence Queen Cartimandua, he so impressed the Senate with his defiant speech that he was allowed to live with his family in Rome.